This vodka dirty martini is one of my favorite cocktails! It’s perfect. A wonderful combination of vodka, vermouth and olive brine, it’s a classic and also one of the world’s most recognizable cocktails. When I last blogged about this delicious cocktail, it was to re-do one of my first posts. I was celebrating a year of blogging and wanted to show how far I’d come with my photography. Here is the original post. I knew very little about photography and even less about editing photos back then. There is always something to learn and blogging is a process, but I’m happy with my progress after 3+ years. So, if you’re just starting out, keep practicing. It will pay off. Why did I re-do the post again? Because it’s one of my tried and true cocktails that always is a pleasure to imbibe and I love refreshing the photos. What vodka is best for a martini? What is a good vodka that won’t break the bank? Can you make a martini without vermouth? It is a martini made with the addition of olive brine. Here’s where I draw a hard line. You need to use a good vodka because in a martini, the main ingredient is vodka. 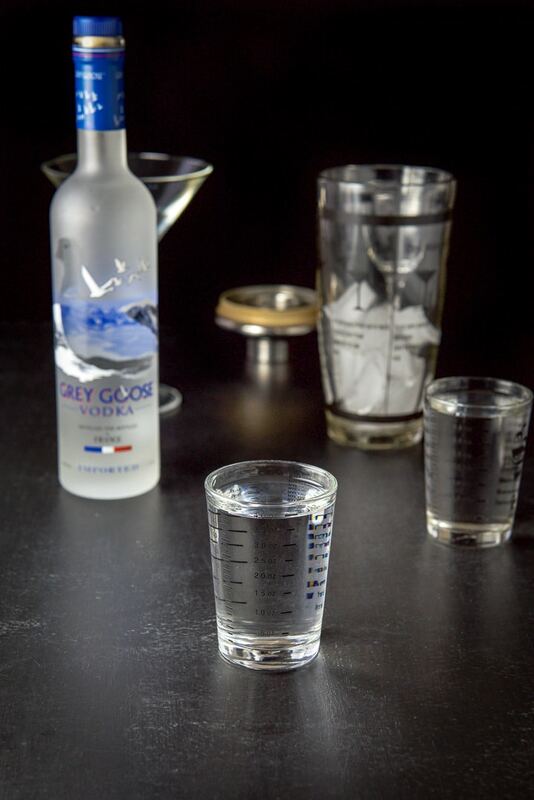 If you use a store brand, it will taste harsh because the vodka is of a lesser quality. 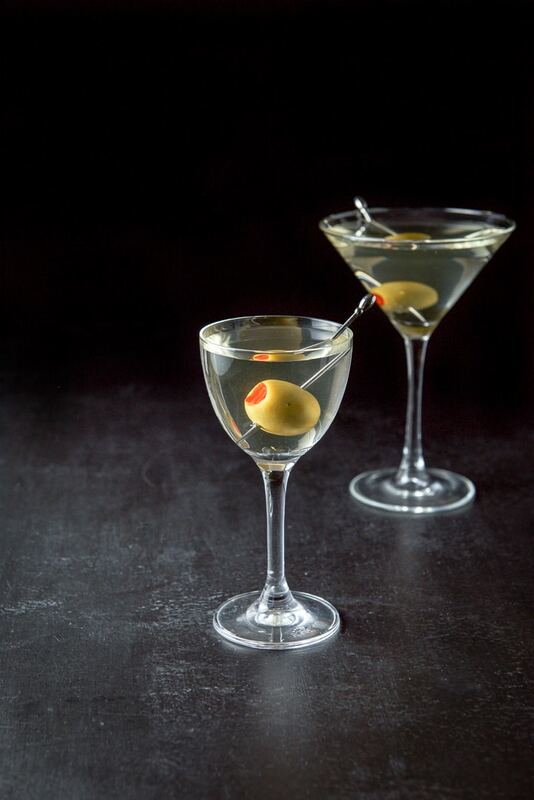 You need at least a mid to premium level vodka for a smoother and more delicious martini. When you go to a liquor store, you will see the difference in the quality of the vodkas by looking first at the prices and secondly, where on the shelf the bottles are located. You will find the cheapest alcohol, in this case, vodka, on the bottom few shelves. As your eye travels up the shelves, you will notice the brands becoming more well known and more expensive until you reach the top shelf, which houses the most famous and most expensive brands. But back to answering the question. If you really are budget conscious, go with the Absolut brand. It’s a solid vodka and won’t be as harsh as other, cheaper vodkas. If you want a vodka that is a step above Absolut, go with Ketel One, which is even smoother. And if you want a really good vodka, go with either Grey Goose as I do, or Belvedere. Indeed you can and I know a lot of people who do. The first time I made this cocktail myself it was without vermouth. You could technically call this martini a dry dirty martini because it calls for so little vermouth. In fact, nowadays when someone asks me for a dry martini, I will ask if they want any vermouth at all. A wet martini, on the other hand, is equal amounts of vodka and vermouth, but I’m not fond of the wet martini. You will see in the recipe, and especially in the photo, how little vermouth I use. And that amount is for 2 cocktails. Sometimes, if I want the barest minimum, I pour a tad in the martini glass, swirl it around to wet the sides and dump the vermouth in the sink. Use the best vodka you can afford. Vodka is the main ingredient and since you are not adding a fruit juice, you will be able to taste it. The better the vodka, the smoother the cocktail. The lower quality vodkas will be more harsh. Play with the amount of vermouth as everyone likes different amounts. Try the recipe as is and if the result is not to your liking, add vermouth in small increments until it’s to your taste. You will also have to play with the amount of brine. 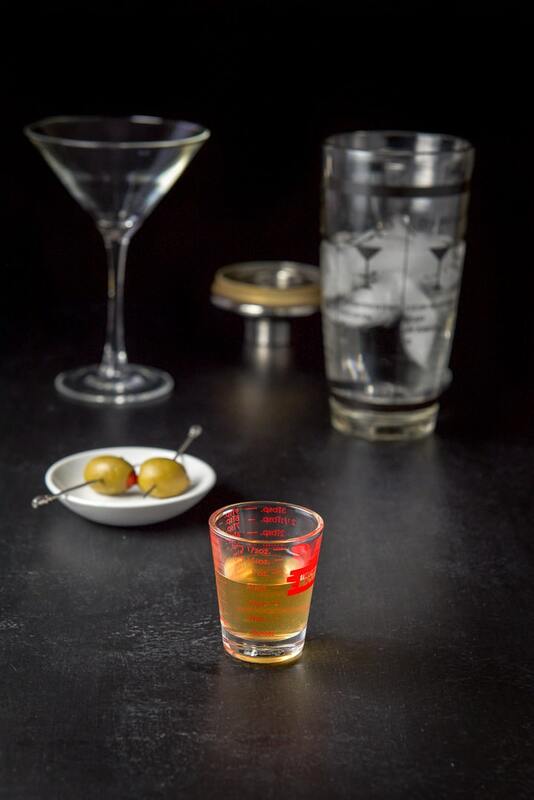 Go with a little less than 1/2 ounce per martini and see how you like the taste. Add more if you want it dirtier. I recommend the Pearl brand olives. (The one linked isn’t the exact ones I use but I wanted to show you what the brand’s packaging looks like, so you will recognize it in the store.) They are the only green olives I like and I would never change brands. If I go to a restaurant, I don’t eat the olives because they don’t use my beloved Pearls. 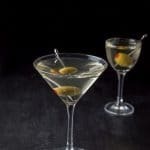 The Pearl brand olives I use are soaked in vermouth so I adore using the brine from these olives in my martinis. 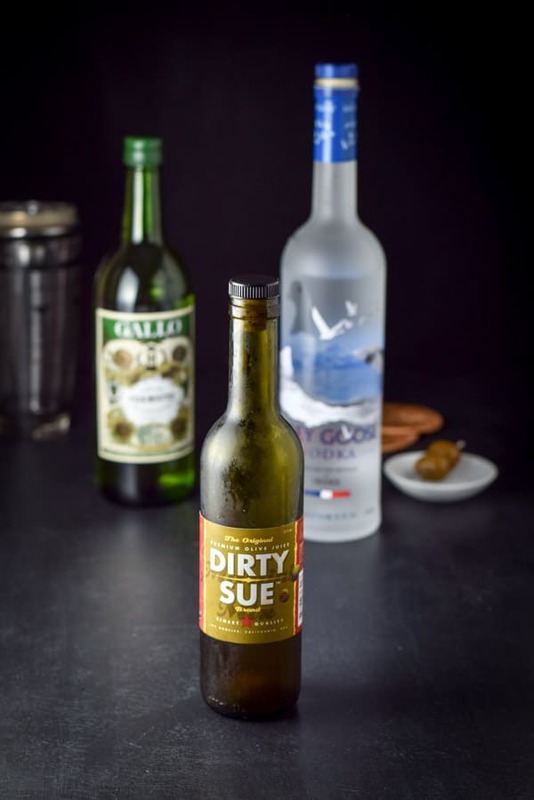 If you can’t find them in your local store and you are tired of running out of brine before you get to the last olive, buy the Dirty Sue brand of olive brine. It’s the best tasting brine out there (other than the brine in Pearl olives.) I get Dirty Sue from Amazon. Martinis are so fun and delicious poured into a glass that comes straight from the freezer. That tends to make the martini stay cold longer. I didn’t use a frozen glass in this post because the glass would not stay frosted in the time it takes for me to photograph the cocktail. Fill cocktail shaker halfway with ice and grab two martini glasses. After measuring out the ingredients, pour them into the shaker. Gather the ingredients – vodka, olive brine, vermouth and olives. Measure 8 ounces of vodka. 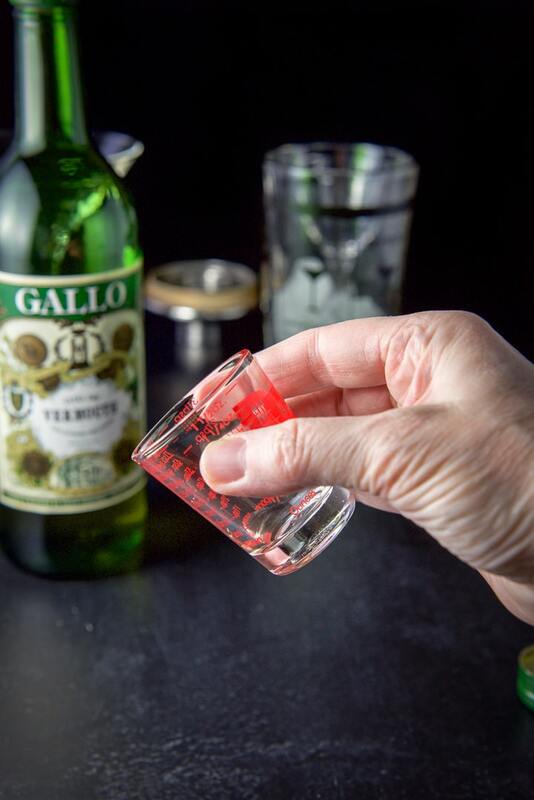 Pour a small amount of sweet vermouth in a shot glass. As you can see, it’s a very small amount. Don’t be tempted to pour it directly into the shaker because you will probably over pour. And this way, if you do over pour, you can put the vermouth back into the bottle. Measure 3/4 ounce of olive brine. Cap the shaker and shake vigorously for 30 seconds. I try to get the ice to break up somewhat so little micro chips are poured into your glass. Place the olives in the glasses and strain the vodka dirty martini between the two glasses. I adore the first glass which is called the Nick and Nora glass, but it is slightly smaller than the one in the back, which is a classic martini glass. 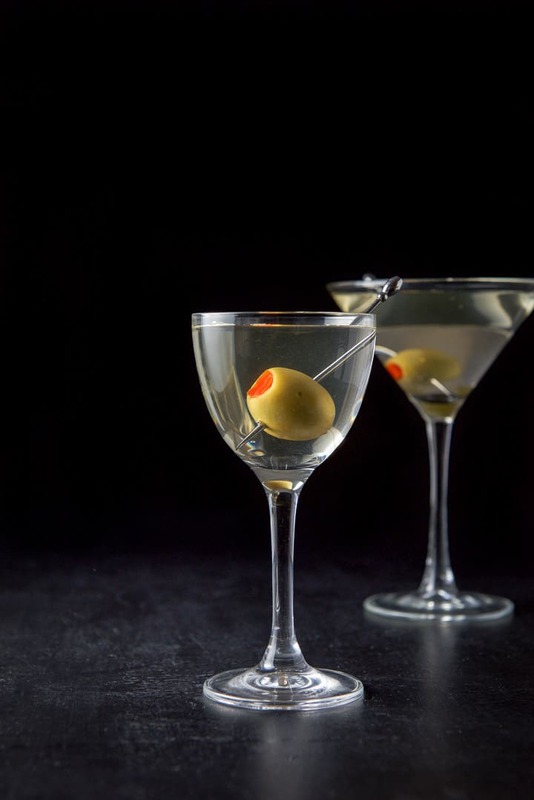 I hope you enjoyed this vodka dirty martini recipe. 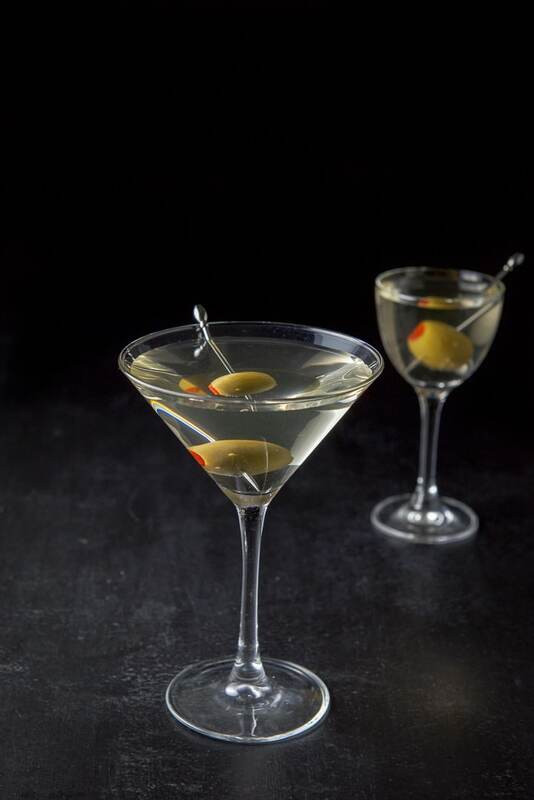 What is your favorite way to drink a martini? And as always, may all your dishes/drinks be delish. If you’ve tried this Vodka Dirty Martini recipe, I’d love the know what you thought about it in the comments below. I love hearing from you! You can also FOLLOW ME on FACEBOOK, TWITTER, INSTAGRAM and PINTEREST to see more of my delicious food and delightful cocktails! Published originally in September of 2016. Just got done looking at the original post. That was fun to see. You have come a long way, Baby!! Your fave rave cocktail! Cheers! I love martini’s and this one looks so good! The perfect relaxing drink that’s a classic. Thanks Sharon! I love them too! I have to say the one time I had a dirty martini I didn’t like it, but I really love olives. I’m going to give it another shot with your recipe! Love the photos by the way. Thank you so much Urvashee. Hopefully, you’ll like it. I find that the culprit is the vermouth. People put too much in. I know a couple of people who would LOVE this for happy hour! Woot! Me too Tisha! Cheers! This is such a classic drink – EVERYONE (who takes their drink seriously) should know how to make! I didn’t. Now I do! I love the shots you took for this one! I kinda really want a drink now tho! Your photos are wonderful! I am almost ashamed to say, I have never had a martini before! I want to give this a try very soon. It always makes me think of James Bond 🙂 I love the idea and twist of the dirty martini. Thanks Alexandra. Don’t feel ashamed, most of the people that I know can’t make a martini. But it’s a fun and classic cocktail and you’ll feel cool when you succeed!